When I paint, I draw from my reading of mythology and from my study of ancient cultures. This work explores the age-old mythology of the fountain of youth. The central crisis in the story-line of the painting is that of the Mona Lisa's aged and decrepit condition. The Hero in the story, the monkey, applies his understanding of the transformational mysteries and methods of alchemy to aid in her revitalization. 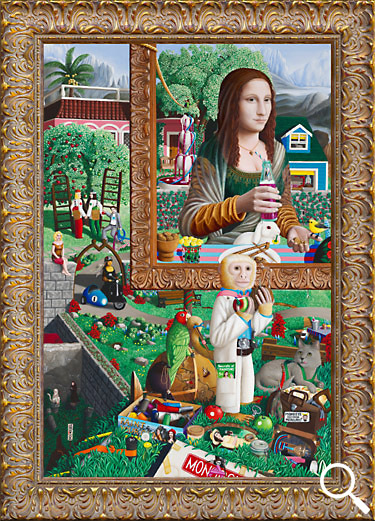 The main portion of the painting containing the monkey and the apple tree depicts the present, while the framed Mona Lisa “portrait” part of the painting illustrates the near future. The two time-frames provide a mechanism to illuminate Mona's transformation by the elixir of life. I have drawn on methods and devices inherited from multiple traditions of painting and storytelling to deliver a visual narrative. What may at first appear to be random is highly structured, and arranged to tell a story. Each part of this painting relates to the other parts in a complex network of colours, themes and symbolism. The story presented here is not linear, but is instead intended as an object of musing or reverie. 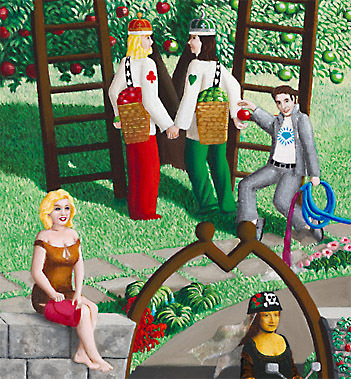 The four alchemical elements are embodied by the characters in front of the apple tree. The King and Queen represent fire and water, while Marilyn Monroe and Elvis Presley represent air and earth. Each of these figures is distinguished by colours and symbols that are reflected elsewhere in the painting. Careful examination of this scene will provide further keys to the story. What are the King and Queen looking at? What are Marilyn and Elvis doing? 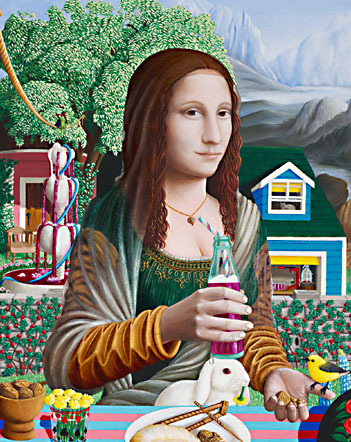 The Mona Lisa's restoration in this work is accomplished not through the methods of art restoration, but by the elixir of life, which the monkey retrieves from its source at the top of the fountain. It is not the famous painting of the Mona Lisa that the monkey has set out to restore, but the lady herself.